Oh the difference a year makes! 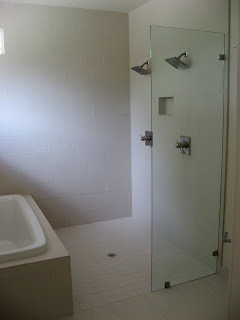 As of this morning, the tile, toilet, and glass wall are back in, so we should be able to move into the master bedroom today. We've progressed to perhaps 98% moved from the temporary house and 30% unpacked. There's still a long way to go. I was hoping to go back to work tomorrow, but with so much left to do and the cabinet and lighting folks coming tomorrow, that's not going to happen. As I sit here typing, I can't help thinking how surreal it is to be sitting here in a space that wouldn't even exist if we hadn't had a vision and then poured our hearts and souls into bringing it to life. We're about 95% finished bringing everything from the temporary house to the new house, and about 20% finished putting things where they belong in the new house. It's exhausting. I swore I'd never move the last week of June again, since that's when we've moved each time before, and it's really, really hot, but there we found ourselves again.... Although my mom's visit was supposed to be a relaxing time after (six weeks after!) we moved in, she and her husband have been an absolute godsend this weekend, as they have cleaned and packed and carried and unpacked. More later. I'm stinky and hungry and the house is a mess, and I can't seem to make myself get in the shower or sit down to eat because there are so many boxes begging to be unpacked (or at least relocated). We have a really wonderful, low-stress life...and we want it back. There are things I've been waiting to do for MONTHS -- buy new socks, get a facial at Milk + Honey Spa, etc. -- but in an effort to put every penny we could into the house or because we're just going to have to pack it up and move or whatever, I've been holding off. I WAS SUPPOSED TO HAVE NEW SOCKS IN MID-MAY. Instead, I'm still wearing my old socks, which inevitably get dirty by the end of an evening walking around the temporary house (there is no entry area, so even though we don't wear shoes inside, anything that comes in on our shoes ends up getting tracked throughout the house). 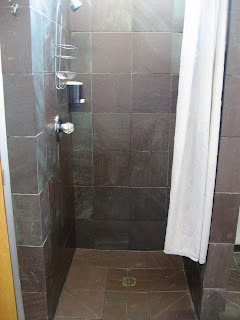 The master bathroom is looking like...well, like April, when the original radiant floor mat was going in. Tomorrow it should be mortared in place, and hopefully the tile work will begin. We're also scheduled to close on our permanent loan on Friday. In a fit of optimism, we rented a U-Haul for Saturday. Stress makes me really unpleasant. I get impatient (I mean, even more impatient), and I become uninhibited about sharing my feelings when I feel like I'm not being treated properly. So between things going on at the house and delays and excuses regarding our loan, I've sent a lot of sternly worded e-mails (and one voice mail that wasn't my finest moment) in the last couple of weeks. Between Monday and Tuesday I believe I sent five to the mortgage company, and while each one (and each response...or lack of response) only increased my aggravation, the result was that closing was moved up a day (from next Monday) AND we scored a 1/4-point break on our interest rate. But the point of this post is that I want my life back. I really, really do. I miss lazy days with Steve and the bunnies. So, since our weekend wasn't taken up with moving (although we should be packing or organizing -- or anything but blogging -- right now), we decided to jump ahead to some of the details that are going to become imminent once we do move (if we ever do). Which meant that we went shopping. 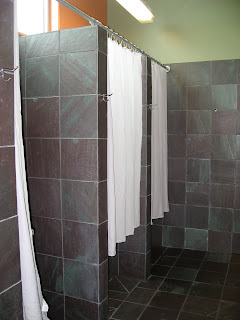 Next, we've been looking for a shower curtain for the mudroom. 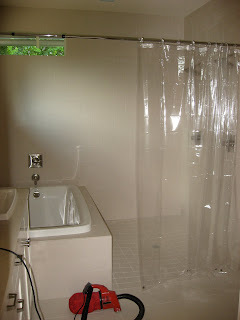 Once the showerhead was finally hooked up, we noticed that water splashes pretty far out of this shower, so we need a curtain that will go pretty much all the way to the ground. But since most curtains are only six feet tall, that would mean that the rod would have to be hung just six feet above the floor -- awkward (and hazardous for taller showerers). Some shower curtains come in seven- or eight-foot lengths, but finding one that looked right was going to take some searching. And then we found this curtain at World Market. 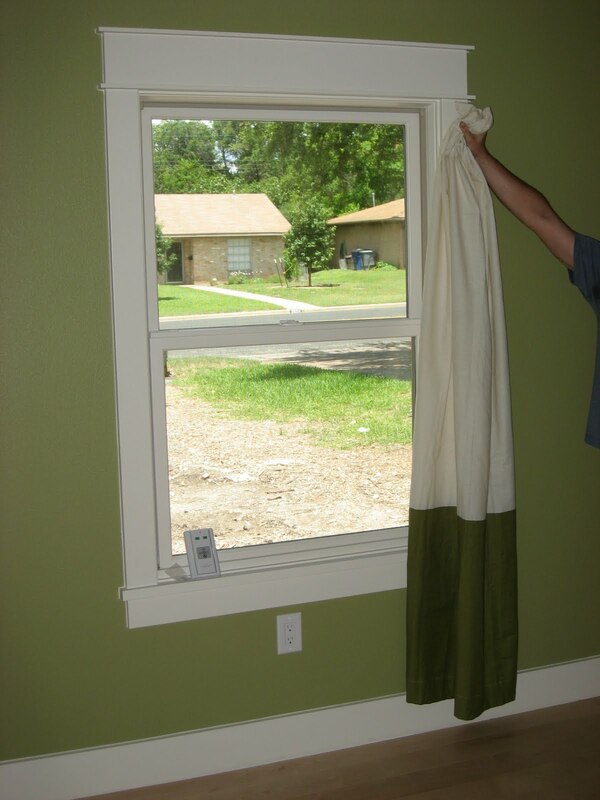 It's a window curtain, not a shower curtain, but that's actually better -- its four-and-a-half-foot by seven-foot dimensions are pretty much perfect for a four-foot-wide shower, and its sturdy burlap-like material will be easily washable so we don't have to buy a separate liner. It wasn't cheap, but since it has grommets for hanging, I can return the shower curtain hooks I bought recently. 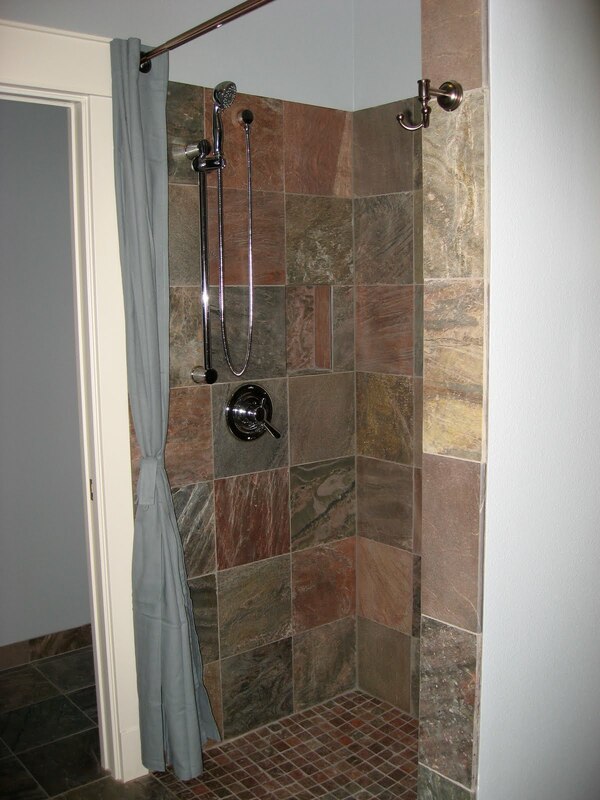 And I think the color looks great with the tile (probably even better than the wall color, which is brighter and bluer than we wanted and is likely to be one of the first things we change after we move in (if we ever do)). It even came with that tie to keep it tidy when not in use (which will be most of the time). 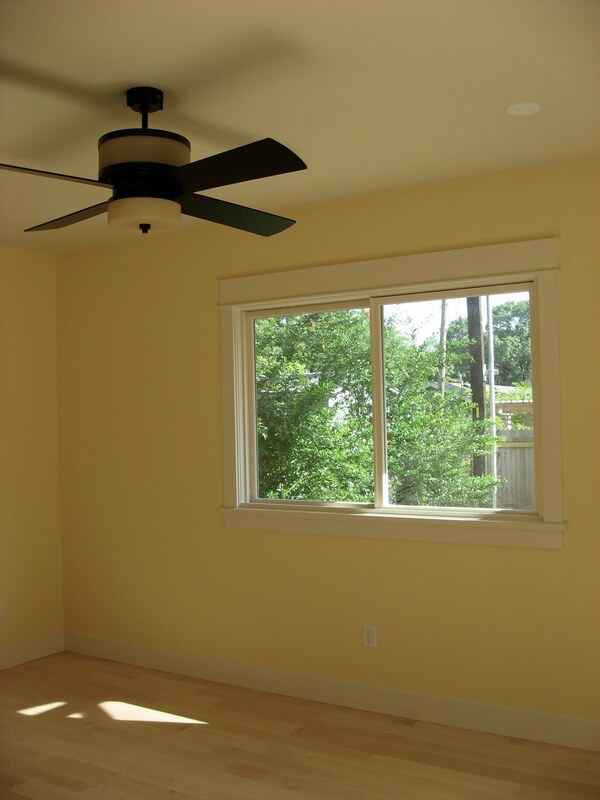 I've also been on the lookout for curtains to cover the windows so we're not living in a fishbowl when we finally move in (if we ever do -- have I mentioned that we've become skeptical that day will ever come?). The long-term plan involves top down-bottom up cellular blinds for most of the windows, but that's quite an outlay at this point, and we're not even sure what color we would want for each area. 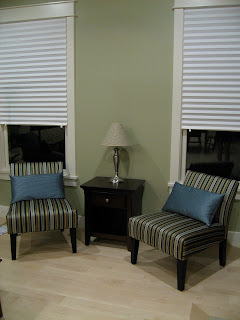 We're probably going to end up buying a bunch of those paper temporary blinds from Home Depot, but I'd love to find curtains for as many windows as possible to save the expense and waste of something I'm just going to take down over the next few months as we find permanent window coverings. So, if you ignore the fact that we're paying rent, a mortgage, two sets of utilities, renter's insurance, homeowner's insurance, and property taxes...with no realistic expectation of actually being able to move, it wasn't such a bad weekend. Today the home section of our local newspaper featured a house that used to be one-story but is now a two-story thanks to a downstairs addition. Yes, a builder bought a lot (in a fantastic central neighborhood) that had a 1930s bungalow on it. 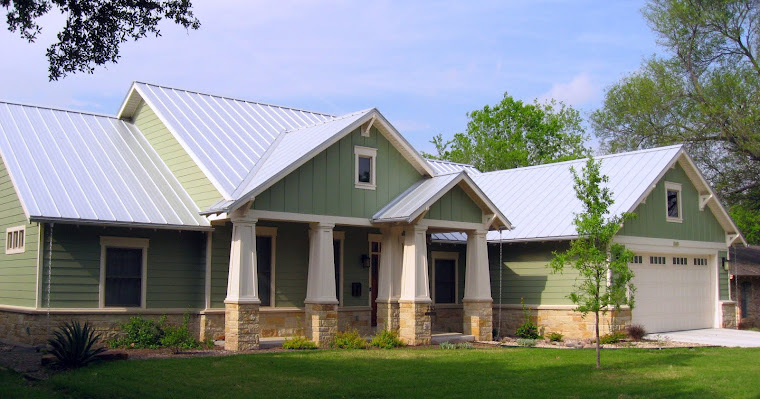 Instead of tearing down the house or trying to add a second story on top of a house that wasn't designed to support all that weight, he raised the original house up in the air and built a new first story below it. Wow. You can read the article here or look at the builder's blog here (the posts are in reverse order, of course; about halfway down the first page, you can see the end stages of building the new first story below the elevated old house). Today, for the first time since Dash got sick three weeks ago, he voluntarily ate more than a few bites of bunny food. And such a handsome little devil! He's lost a lot of weight but put two ounces back on between seeing the vet on Tuesday and again on Friday. We're hopeful that he'll have put on another few ounces by the time he goes back next Tuesday. Today we didn't get much packing done (there didn't seem to be much point -- we still haven't heard from R whether we're talking days or weeks to get the master bathroom put back together). Our big accomplishment of the day was finding a good use for the thirty or so quarts of sample paint. Sherwin-Williams suggested finding a school that wanted them, so I thought about stopping by the elementary school around the block from the temporary house, but the paint containers say "keep out of the reach of children," so that seemed like a bad idea. I offered them to a co-worker who has a high schooler, but with school getting out for the summer, she didn't think they'd be interested. She suggested that a theater group might want them, so I e-mailed an actor friend; he said he'd check with his people, but I never heard back. Finally this week, R's right-hand man, R2, told me that he had heard of an organization that accepted paint for the disabled to make art. He didn't know the name or the exact location, but he said it was somewhere on the main road that passes by the new house. Enter Google. Within seconds, I had found The Arc of the Capital Area Studio and Gallery. When we stopped by, a class was in progress, and they were thrilled for our donation. It doesn't really get more win-win than that! I'm still amazed that there were thirty samples -- not because it's so many (although it's a lot), but because thirty samples works out to about three samples per color we eventually selected. Is that all?! 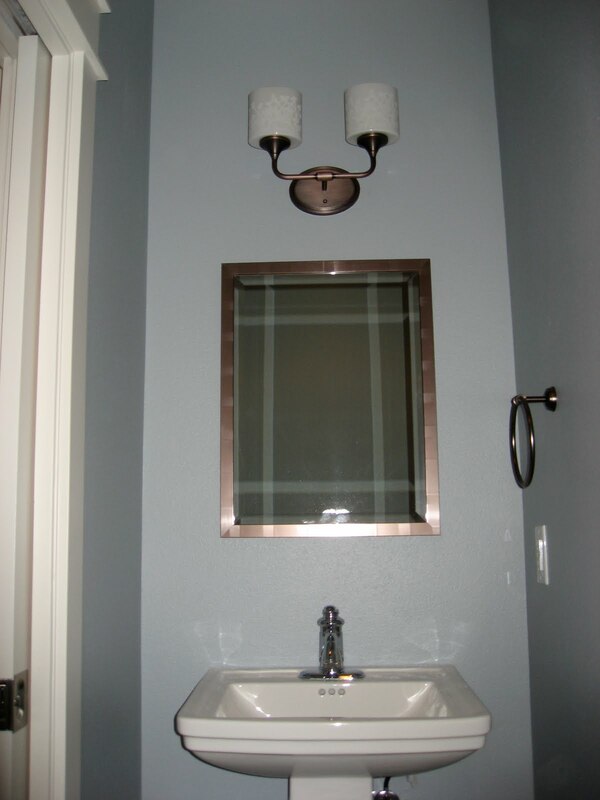 It seemed like a lot more than that, and we went through more like seven or eight before settling on the ceiling color (which we also used in in closets and three of the four bathrooms). 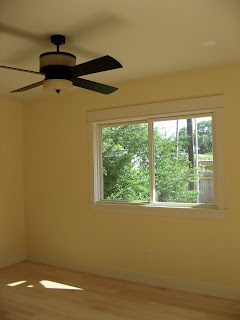 But we copied the exterior trim color from another R job (without any samples) and only got one for the interior trim color, so I guess that offsets some of the rooms where we were less decisive. On the subject of paint, the painters came back for touch-up yesterday and poured some of the leftover paint (which they buy in gallon or five-gallon containers) into quart containers for our future touch-up needs. When I took this picture of the kitchen, finally sporting a refrigerator, there were the touch-up quarts lined up (and marked en Espanol) at the micro-center. You can feel the cushions but you can't have a seat. You can dip your foot in the pool but you can't have a swim. You can feel the punishment but you can't commit the sin. I'm not a patient person, but I do okay faking it for the sake of politeness. Today, however, my patience ran out. We have a fabulous house (albeit not a mansion) full of modern amenities, on which we're already paying a mortgage, property taxes, insurance, and utilities...and yet we're living in a not-so-fabulous house full of 1960s amenities and BUGS. Oh, and since we've been planning to move this weekend, there's no good food in the house. As you can imagine, the hunger doesn't help the crankiness. 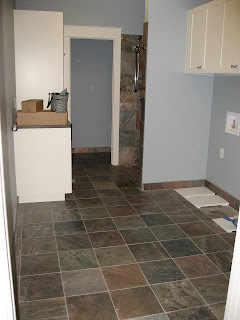 In addition to other incomplete items, we've been waiting on a repair to the radiant floor in our bathroom. Since it was installed (by R's handyman, whose qualifications to do the job we questioned from the start), it hasn't worked due to a short in the wire mat. (Radiant floor systems are designed as more-or-less DIY projects. They have very detailed instructions (and even a video) that make the installation pretty straightforward...if you follow them...which the handyman -- let's call him Ryan -- didn't.) We've been arguing with R about various issues related to the floor since it went in. If we had fully understood all of the ways in which Ryan was going to botch the job, we would have taken it over from the start. Instead, we trusted that R had it under control, gradually identified additional oversights, and were appalled to learn that Ryan was charging us about as much per hour as a computer engineer with a Ph.D. would make around these here parts. Needless to say, we weren't even a little surprised when R told us that the floor had a short. He brought in his electrician (why didn't he install the floor in the first place?! ), and they ordered some equipment that was supposed to find the problem so they could pull up the one or two tiles needed to fix the problem. Six or seven tiles later, they thought they had identified the short, but after they fixed it, they discovered that there was at least one more short...that they couldn't locate. This afternoon R decided to cut his losses and start over with new radiant mats and a whole new tile floor. We don't know yet how long that is going to take...but I think it's safe to say moving on Monday is out. (Ironically, however, our refrigerator did arrive today.) I was scheduled to take today and next week off from work for an easy, gradual move, but I went to the office today anyway because there was no moving to be done. Monday will be the same, and most likely Tuesday and Wednesday, too. With family coming for a visit on Thursday, I really have no idea how it's going to get done. I realize that all of this paints a very negative picture of R. And we're amply irritated with his decision to entrust Ryan with such a technical task. But it's important to keep in mind, and I can't stress enough, that he really is one of the very best builders around. This was reaffirmed yesterday when we hired one of the best home inspectors in Texas (arguably the best) to inspect our house. 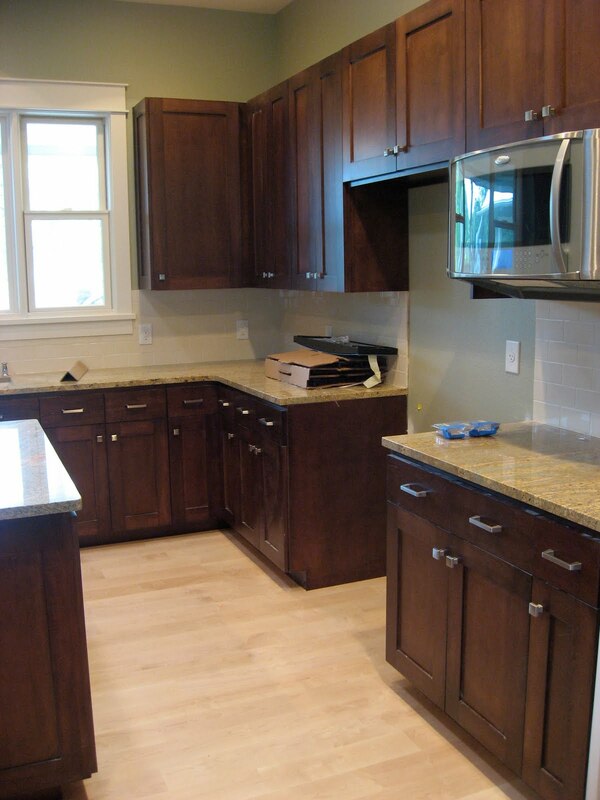 While he identified a number of concerns, he was extremely pleased with the overall quality of the construction. Since he looks at houses (primarily new construction) all day, every day, and is used to having to tell builders to fix much more significant issues, his positive feedback was very reassuring. A few things happened at the house today that are worth mentioning. First, the gas meter was installed. Funny, I don't remember ordering the satellite dish upgrade. I hope it gets Bravo (we don't have cable). We also received a package in the mail today. 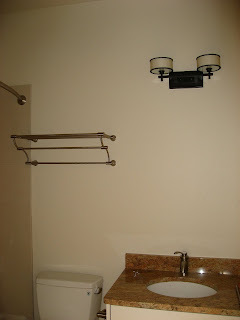 Sunday night I placed two orders for house things: (1) a mailbox, and (2) a special towel bar for the master bathroom. I quickly got notice that the mailbox had been shipped, but I didn't even get a confirmation of the other order, so it was a pleasant surprise when a (hybrid!) UPS truck drove up this afternoon and dropped it off. Which worked out fine for the back bathroom, since it's tiny and can use the extra storage space the hotel rack provides. And now that we received our delivery, it's also working out fine for the master bathroom. 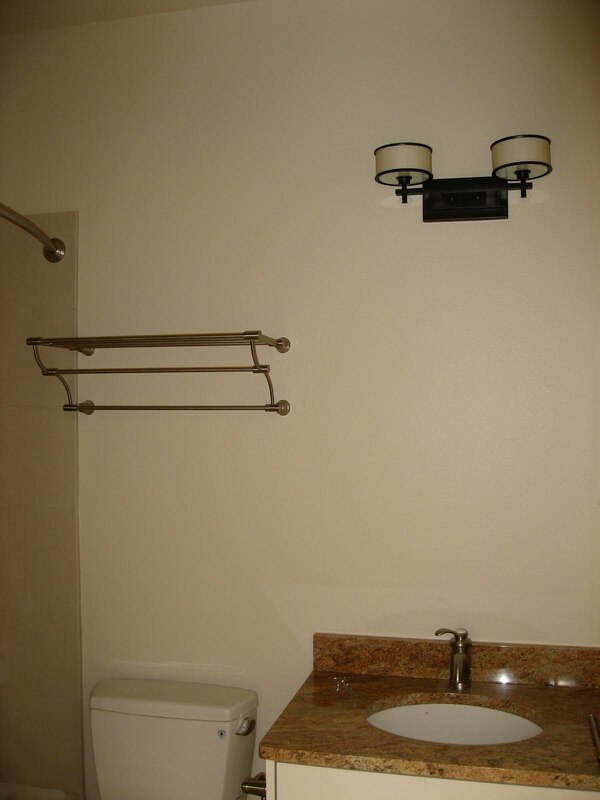 This towel bar attaches at a single mounting point (on the left), and the two bars pivot to hang at whatever angle we want. Remember that 27" wide glass partition? By moving the bars out toward the center of the bathroom, our towels will be accessible after a shower without the need to contort ourselves around the glass. Now that everything is pretty much finished (although there are still a surprising number of small-to-medium things outstanding), it's time to show you some of the spaces and pictures that inspired us in our design and cosmetic choices. Janet suggested flipping the tub and shower, and we decided to put in a glass partition only (no door or curb), leaving a wide open walkway into the shower. 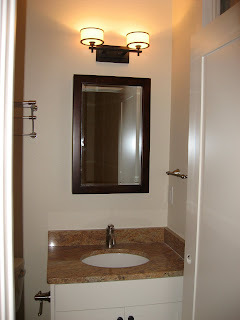 I assume this room's toilet is out in the open to the right, but a separate potty cabinet was always part of our plan, and we tucked it behind the bathroom door. 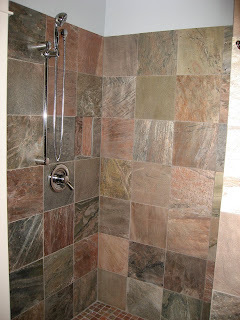 I loved the soft color of the stone and the brick pattern around the tub (and presumably extending into the shower), so we started looking for a similar natural stone. Even in "cost is not a factor" mode, we kept coming up empty -- everything had a lot more variation. 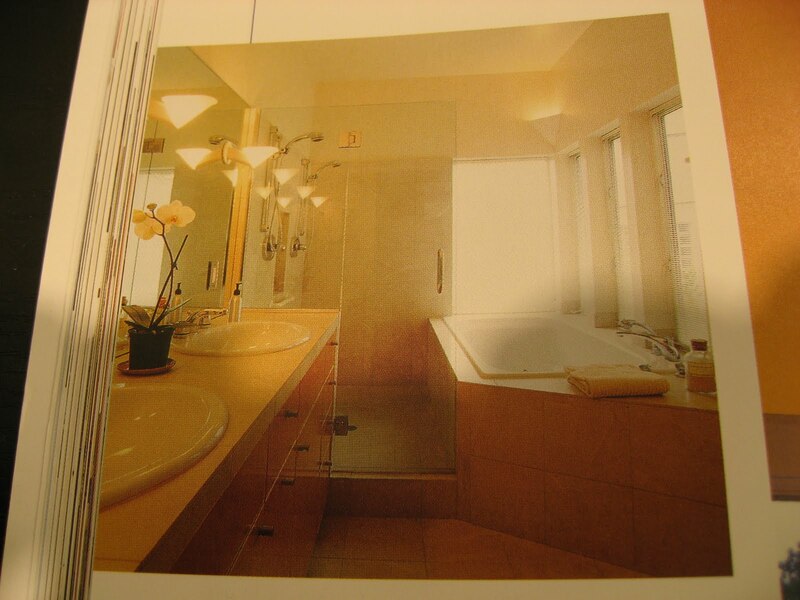 Then one day I found a porcelain tile that looked just like this, and it came in 12x24" tiles...which eventually we realized could be cut into thirds to mimic the look of that wonderful, spa-like bathroom. We ran the tile all the way to the ceiling on the two shower walls. Thank goodness these images, and then these materials, came into our lives at the right time. I honestly have no idea what we would have done with this bathroom if we hadn't stumbled upon these ideas. I'll wrap this up with some news from the home front (er, the other home front): (1) Dash went back to the vet today, got his infected ear thoroughly flushed out, and is on all new medicines (including banana-flavored Cipro, so he's good to go in case of an anthrax attack), and (2) Steve recently finished up a test chip (his own special project), which has been manufactured and tested and is apparently exceeding all expectations. Go Dash and Steve! R put it up with a tension rod. I'll leave it to your imagination to figure out why it's not permanently attached. We're home for a little while this afternoon to watch the half Ironman world championship. When we packed up to leave the house, the car was nice and cool from being shaded in the garage. I'll spare you all of the frustrating details and just say that when the city told us we had to upgrade to a 3/4" water meter, they hadn't actually checked the size of the existing water meter...and it turned out that we already had a 3/4" meter. Gold star to Team R for thinking to double-check that yesterday. Now on to some eye candy. 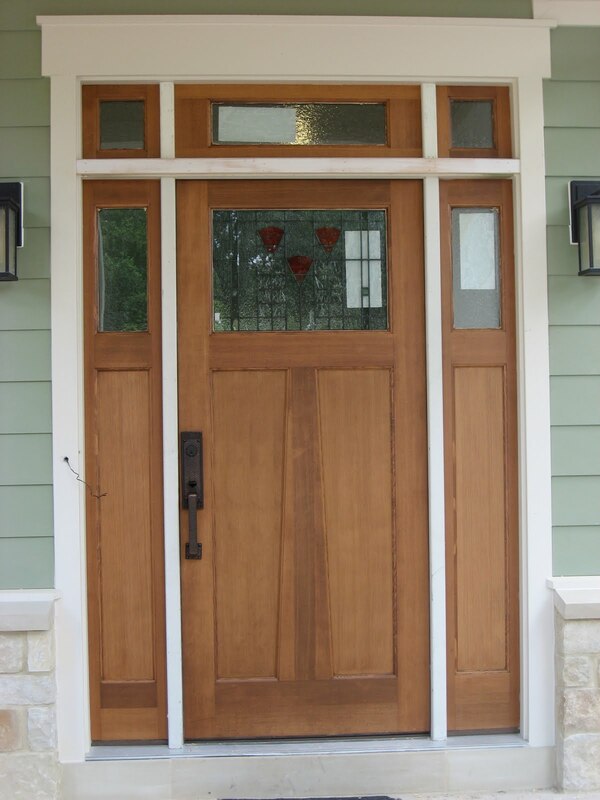 Here's a close-up of the glass in the front door. In addition to the red of the poppies and the little touches of green, there are three different types of glass in the door. 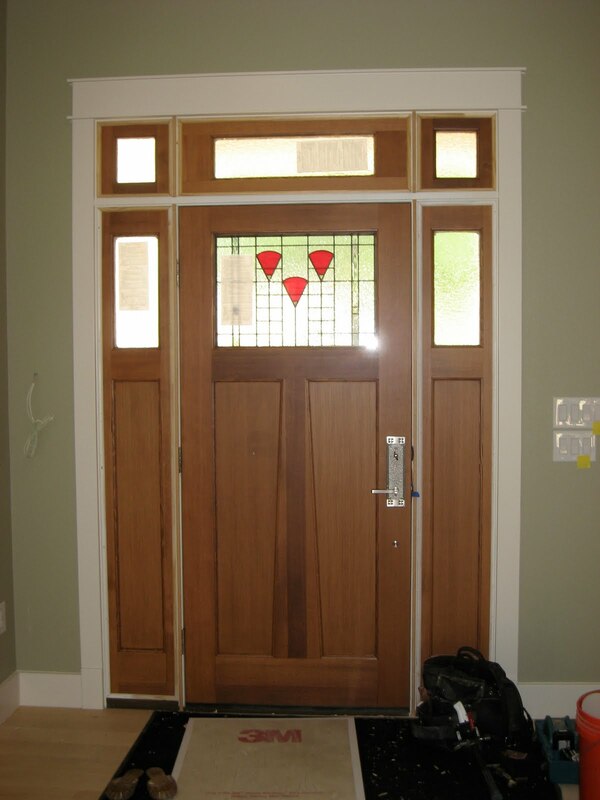 We chose the predominant glass (called "vecchio" -- kind of a seeded look) for the sidelights and transom for privacy. We wanted a single transom instead of the three pieces, but they couldn't get a long enough piece of vecchio glass, so we had to go with the three-piece transom. People always want the bad news first, but this news is just too awful. It would completely overshadow the good news. So on to the good news: our front door unit went in! With our fancy Arts and Crafts lockset! The door has been stained, and we mostly love the color, although some of the wood took the stain quite differently, and we're not thrilled with the dark parts. 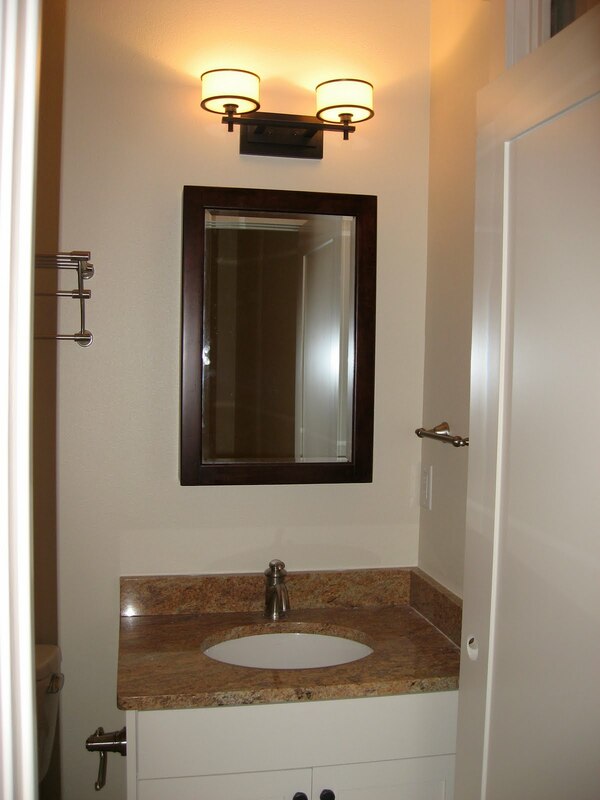 The painter is going to try to lighten those areas, but there are no guarantees. We may not actually get to live there until July or even August. It's been clear since we got our permit that we were being required to upgrade our water meter to a larger size, but Steve and I assumed R was already working on it (to be charged to us later, of course). We didn't learn until today -- as the inspector came for his "final" inspection -- that R hadn't even started the ball rolling on the water meter (and since this has to be coordinated with the city, the timeline is out of our hands). But that's not the bad news. 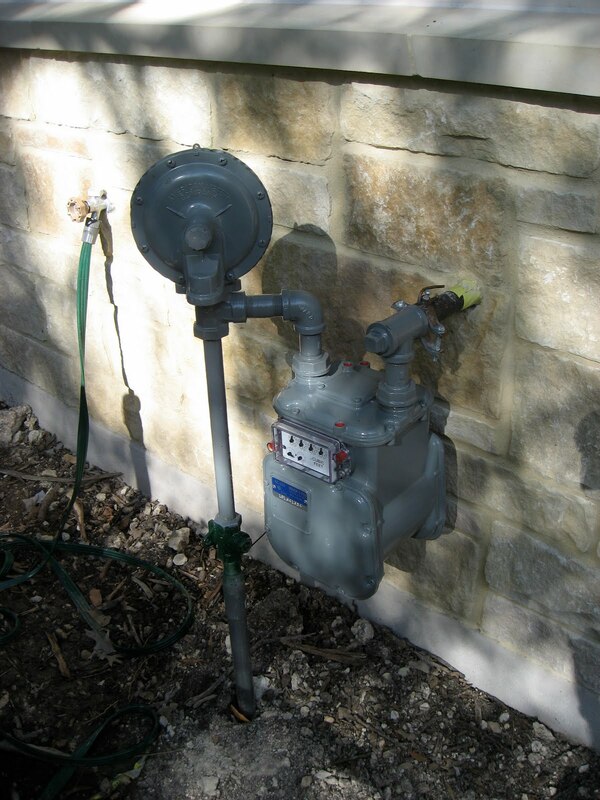 After a few phone calls, I had learned that the line from the water main to our water meter isn't big enough to accommodate a larger meter, so it needs to be upgraded too -- at a cost of roughly $5,000-$10,000. That's definitely bad news, but it's still not the bad news. 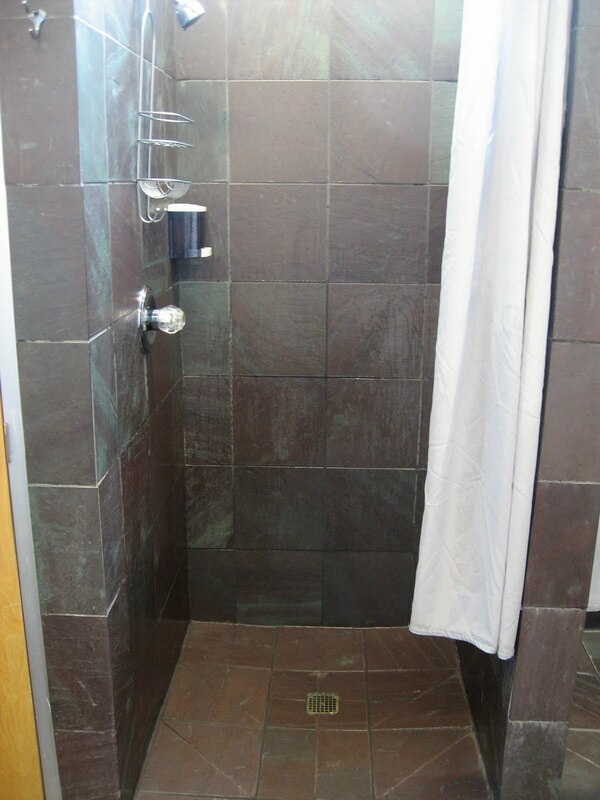 The bad news is that getting the design, approval, and installation work done takes 4-6 weeks. There's no point placing blame for not getting on it sooner, but we're beyond irate that this issue just came to light today. We'll keep you posted. Needless to say, we're bummed. 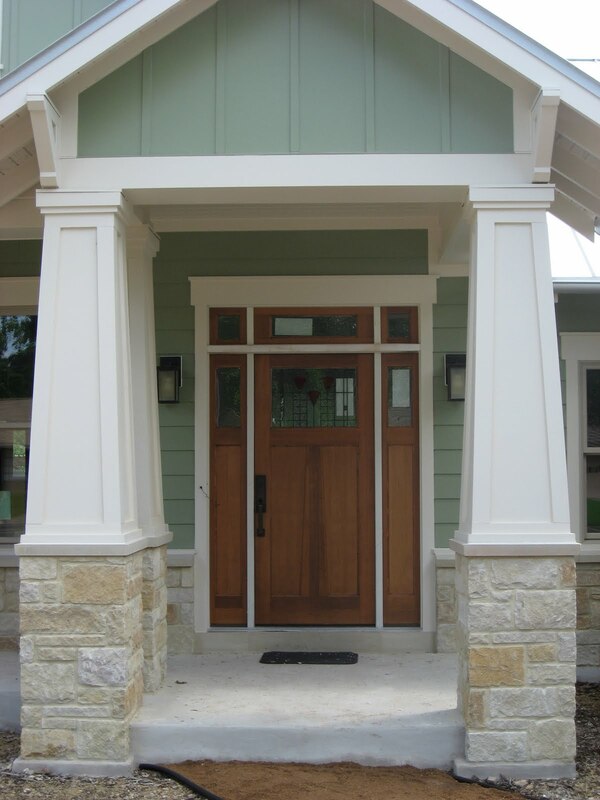 As with everything else, we explored ALL of our options before settling on the idea of an address number tile, and then we explored ALL of the color, shape, and placement options (including putting it above the entry gable or on one of the columns). I think we got it just right. And as excited as I am about this, it isn't even the exciting thing I hinted at in today's earlier post! That one is big. You'll see. 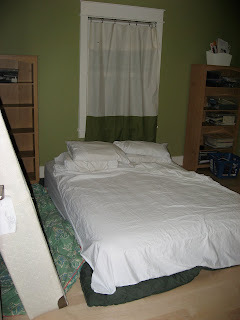 I almost added that this picture shows a completely finished vignette, but the door hardware isn't on yet. And now for a "ripped from the headlines" Thing I'm Not Going To Miss: our current dishwasher, which we long suspected was designed by someone from a culture that doesn't use dishes, and which was actually recalled last week due to a fire hazard. Nope, not going to miss that. Progress crept along today. We didn't get the electrical re-inspection scheduled, so that's pushed to Monday (at least), with the other inspections not able to be scheduled until after that one is passed. Our range still isn't installed, and our refrigerator didn't arrive today -- presumably because the supplier is waiting on our replacement dishwasher to come in so they can deliver both at the same time. It's probably easier to list -- or show -- what did happen today. 1. More door hardware (but still not all of it) went in today. The multipoint levers on the French doors out to the back porch were installed, and they look great. We ended up having big problems with our original hardware supplier, who also handled (or mishandled) our plumbing order, so we made a last-minute switch to a different door supplier. I'm so glad we did. Our new guy, Tim, saw that we had selected a totally different style for these handles because the catalog didn't show the Arts and Crafts levers in a multipoint lever, but he knew that the supplier could swap out the levers and give us what we wanted. A quick phone call later, it was done. The last thing that happened today was that we met with R about that big, ugly money issue. While I'm not going to get into the specifics, I will share two lessons that I hope he has learned from this and a series of similar issues: (1) it's always -- always -- better to be sure your client is on board with any work that is going to increase costs, and (2) if your contract says changes will be agreed to in writing, writing it up doesn't just make the lawyers happy; it also ensures that everyone really is on the same page before the money is spent. 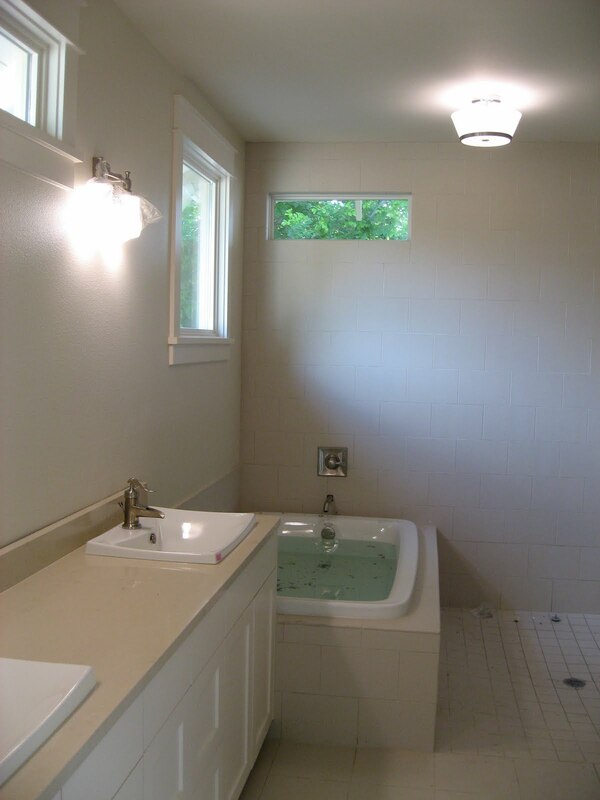 At least, that's what I take away from them saying that our cupcake light over the shower violates code. In order to keep the ball rolling, we had to buy a really unattractive exterior light (no picture) that I hope will satisfy them. If there's a silver lining here, it's that the sidewalk issue didn't hold up scheduling the inspection any longer. Work was done out on the back porch...but can you spot it? 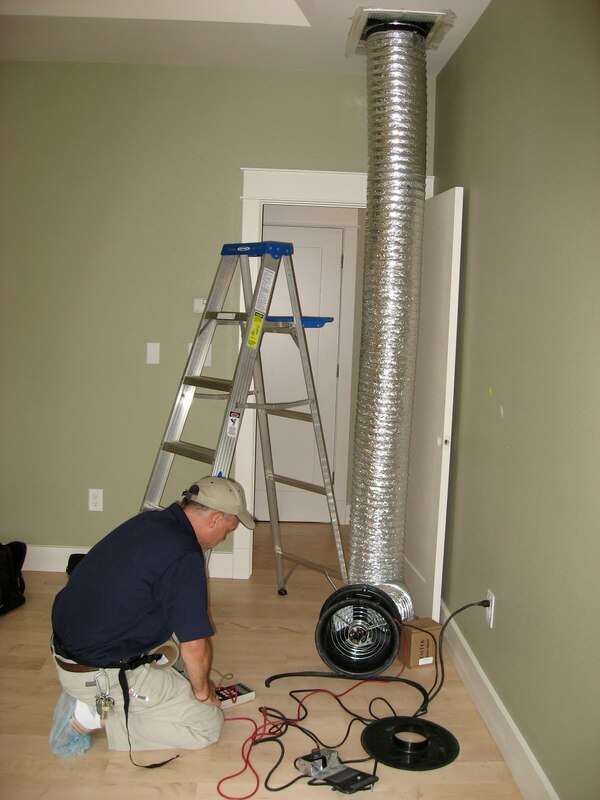 ...so that he could fire up the fan attached to the duct and use his handheld device to see how much leakage there is in our duct system. At least that's the theory. When I left, he wasn't getting a good reading and was still trying to find the vent that he assumed has escaped being covered. I don't know if he ended up figuring it out, and if so, what the results of the test were. I'll keep you posted. Rounding out the day, another money issue came up with R. And it's a big one.